How far are you willing to go for makeup? The caption reads: “Three weeks ago at this time I was finishing up my makeup and getting ready for my princess to make her appearance. 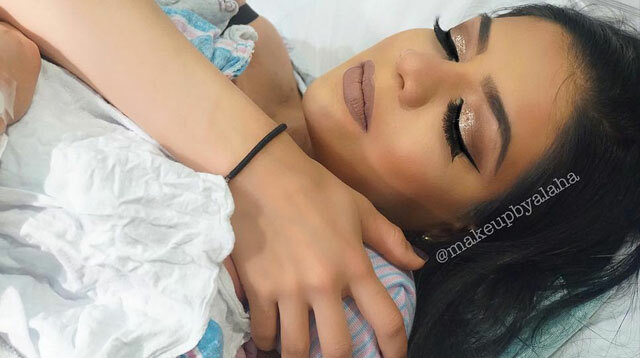 Yes, I was doing my makeup while I was in labor! I was pausing during contractions and picking up where I left off once the contractions passed. I only packed some of my favorite products in my hospital bag...” She even enumerated all the products she had used that day. Including brushes, contour kits, liquid lipsticks, and even false lashes! We are AMAZED. This particular photo is probably our favorite! “When the contractions got too strong, hubby was there to save the day!” #TrueLove, you guys!